You can help publicise the cafe by downloading and displaying a copy of the above flyer! The Social Cafe usually has 10 to 25 come to each cafe. Come and meet our friendly regulars. Anyone new who would like to come along would be most welcome. 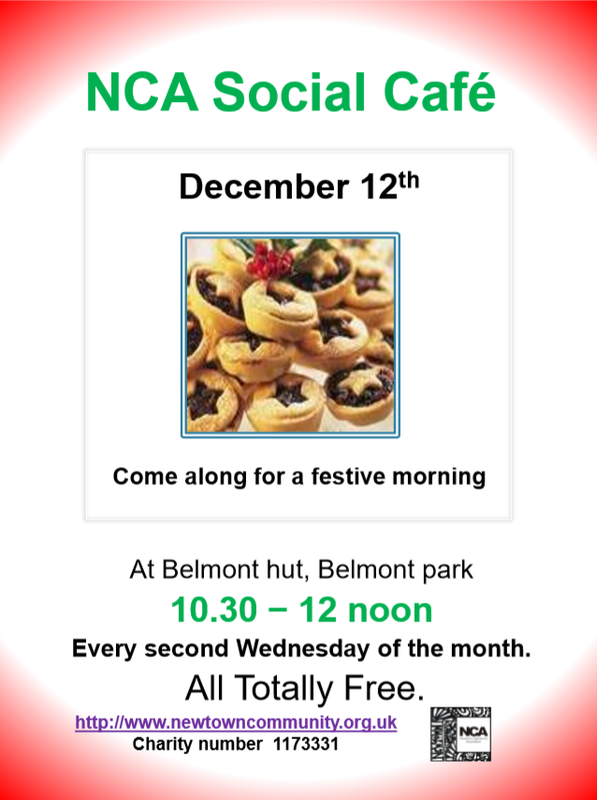 The cafe is from 10.30am to 12noon on the 2nd Wednesday each month. The cafe is free. We may ask for donations towards a charity if there is a talk. Thank-you. If you would like any more information do contact Su Aves on 01392 272793. Over the Spring and Summer of 2017 we had a number of great sessions and cafes gardening, making a herb bed, neatening up the sensory garden, and planting vegetables and wild flowers in Belmont Park with children from Newtown Primary and Newtown Community Preschool. The children also talked to those that came to our cafes about food they eat and food people used to eat years ago. They also found out about cooking and types of foods and spices from other countries. The children cooked vegetable soup and baked lavender cakes and scones which we all shared. 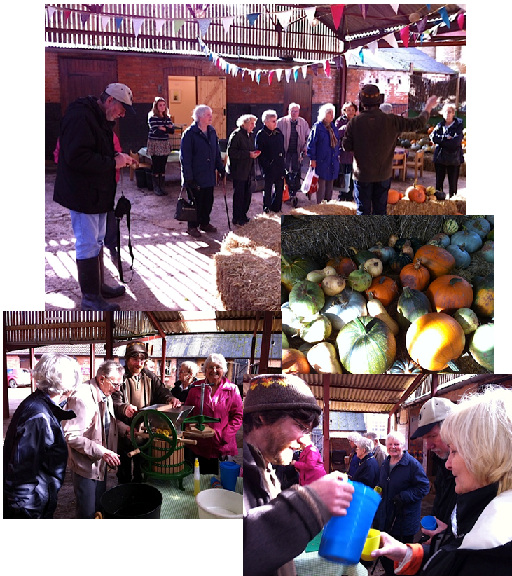 It was all part of the Food Glorious Food project and so thank you to Nicole Redfern for getting us involved. There is now a community herb bed so if you would like to pick a few herbs to put in your cooking at home please take a few pieces and leave some on the plant for the next person. If you have a herb plant you could donate to add to it please do get in touch. 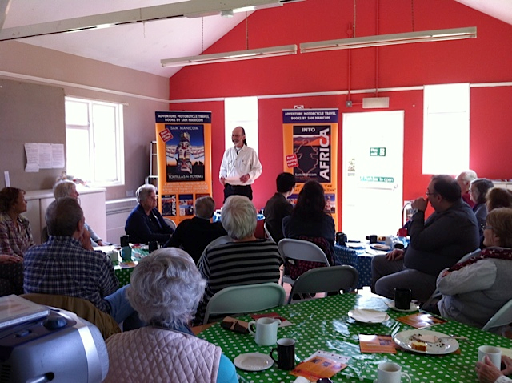 In April Mike Richards returned to give a great talk on the Funny side of Policing and answered lots of questions. He had many stories to share and those that came really enjoyed it. At our cafe on 8th March it was wonderful and the room was full. Maggie Wilson told us about “Making Stage Costume”. She give a fascinating talk on her career as a tailor and seamstress, making costumes for the Royal Shakespeare Theatre, the National Theatre and English National Opera. She expertly explained the day-to-day running of a professional wardrobe department, and how a three-dimensional costume is created from a two-dimensional design. She even had examples of her beautiful work. Everyone enjoyed the talk enormously. January 2017 we had a good get together and talked a lot to each other to catch up with what had gone on over Christmas. In February Nicole Redfern introduced a new project called Food Glorious Food. The Social Cafe plan this Spring to get involved with the children in the Newtown area, at Newtown Primary and the Newtown Community Preschool, to grow food or herbs and share food stories, recipes etc. We had a great December 2016 cafe with seasonal music from Geraint who played the piano beautifully. We tapped our feet and sang along. We had a great talk on 12th October by Mike Richards on the Executions that had happened in Exeter over the centuries. It was fascinating and we had a good turnout to listen to the many varied stories about the individuals who died, those who were executioners and what life was like at the time. An interesting look into the history of Exeter. We learnt so much. Thank you to Mike who spoke for free allowing for there to be a collection for Hospicecare. He is going to come to do another talk in the new year for our Social cafe so do look out for that. They need more volunteers locally as they are asked to help with so many training opportunities that it is difficult to support all of the requests. e.g. one example was teaching young people what to do if someone is scalded when boiling water spills from a campsite cooking situation. All the volunteers learn to do injury makeup to make it more realistic. She showed us how to make up a bruise and a swelling with a cut. It all looked very realistic. You get trained in the art of casualty simulation if you join. The local group trains on the 3rd Saturday morning of the month, 10am-1 pm at St Katherine’s Priory in Exeter but not in August. They give the services feedback on how an exercise has gone. For example an exercise on evacuating a ferry taught the personelle organising the evacuation that people are not always calm and easy to coordinate! She said practicing first aid on dummies, for example, means that a person learns how to do the first aid but the dummy does not answer back. It is important to teach those being trained that they need to consider the trauma the person has had being sympathetic to their needs as well as their injury. This gives the police and ambulance services etc the chance to actually practice this properly and not just do it in theory. You can join the local branch from the age of eight years upwards. Casualties Union was founded in 1942. They will be celebrating an amazing 75 years next year. If anyone has any suggestions for further talks, and who might give the talk, please do let Su Aves know on 01392 272793. 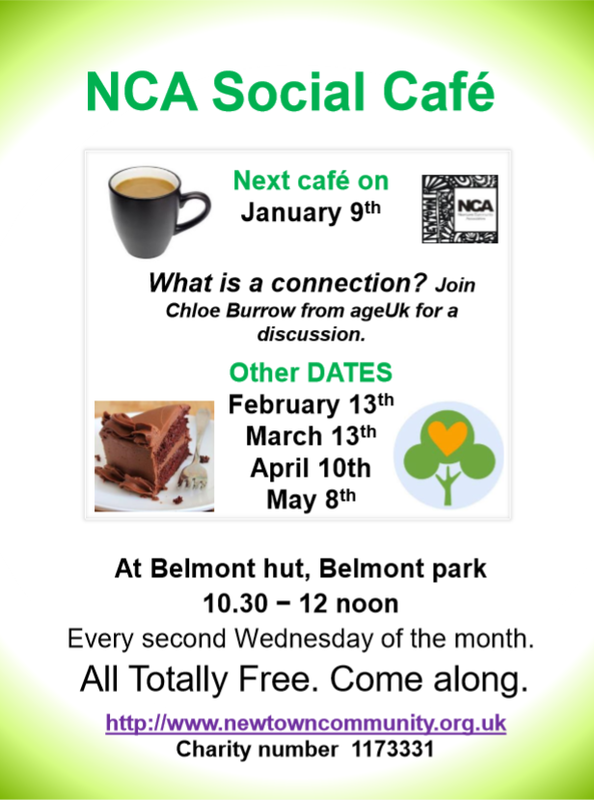 Every 2nd Wednesday, each month, Su Aves organises cafés at Belmont Park Hut for anyone who would like to come. We usually number 12 to 20 at each cafe, sometimes more (there about 30 different people in total who come but not every month). We have hot and cold drinks, cake and biscuits. It is a free cafe. This café started in May 2012 so is a regular and popular event. If you would like to know anything else about the cafe do phone Su Aves on 01392 272793 or email her on secretary@newtowncommunity.org.uk. We would very much like to see new faces as well as our regulars. There is no pressure to come every month, just when you would like to come. Anyone is welcome. We sometimes just talk to each other and sometimes have a speaker or activity. 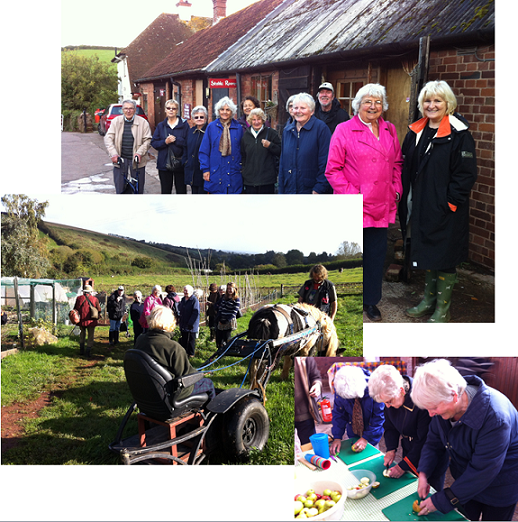 We have been on two visits to Ide Farm and last October we went to the Met Office for a second visit. We also have Qigong every Monday and Thursday which also began from a suggestion from the Social Café (see Qigong for more information). It costs £5 per session. We owe thanks to the Exeter City Council Community grant, Devon County Council and the Express and Echo Cash for your community who have all supported the cafes. Also in a previous year the POCA Incentivisation Funds for Community Projects (Police) supported us. This enables us to run the cafes for free to those that come.